Take the conference home with the Complete Conference Package! 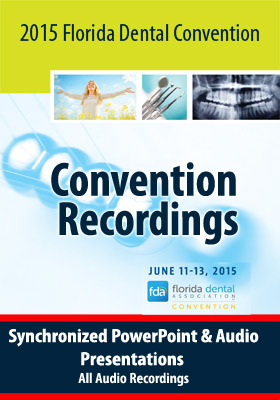 This package features video of PowerPoint slides with Synchronized live Audio for most sessions. Listen to the presenter audio and watch the slides, exactly as is happened live. This package allows you to review presentation materials and is a lasting valuable resource. Plus this package includes the MP3 Audio files of all sessions to listen to on your computer iPod or MP3 player. 25576 C08 Designing an Occlusion — Where Do I Start? 25586 NC02 Calm Mind, Fit Body, Inspired Practice! 25591 C14 Are You HIPAA Compliant? 25598 C17 Advocacy in Dentistry ... Why Should This Matter To Me? 25601 NC09 Getting to "Yes"
25612 C25 What’s on This X-ray? 25613 NC10 You Want Me to Sign What? 25643 NC18 New Dentist Program: "Start Smart — Stay Smart"
25644 NC17 Set Your Practice on Fire! 25648 C45 Your Guide To A "Legal" Dental Chart! 25649 NC20 Lead-ur-ship Starts with You!